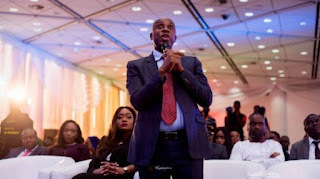 Segun Sowunmi, spokesperson of the Atiku Campaign Organisation, and Rotimi Amaechi, minister of transport, had a clash of words at the first 2019 presidential debate. The debate, which was hosted by The Osasu Show and held at NAF Conference Centre and Suites, had Sowunmi as the representative of Atiku Abubakar, while President Muhammadu Buhari sent no one. Speaking on the plans of the Atiku campaign as raised by Sowunmi, Amaechi, who was not on the debate panel, raised up his hands to ask questions from the Peoples Democratic Party representative. He said the Atiku-Obasanjo led a privatisation of Nigeria’s assets to their cronies. “The first question is that they privatised, to who? Who did they privatise to? To themselves, and they are coming back. Then I was a young man, I didn’t have money to buy,” Amaechi said. “Question number two, let me thank the woman who said power had improved. Under them, with $16 billion, we had 3,000 megawatts of power, now we have 7,000. “Three, and finally, on railways, we all go to Kaduna. We are talking about railway, who has the railway? Our government right?”. Responding to Amaechi, Sowunmi said Amaechi was speaking trash, rather than sticking to an issue-based campaign. “An eight-year governor of a state in PDP comes to public space, riding on the alleged integrity of just President Muhammadu Buhari, and speaking trash to the people, what exactly is this,” Sowunmi said. “Now, we had assumed, we had signed up to an issue-based campaign, and we just want to beg the operators of this present government to stick to the issues. Sowunmi went on to speak to some of the issues regarding the campaign, on behalf of his principal, saying the government should stick to regulation and let those with capacities run businesses.